>>>Many dark secrets swirl within the life-current of a girl with the power to touch souls. Legends will rise. The darkness will resist. Ten thousand leagues of uncrossable ocean separate Zhialeiana from her destiny. At the end, she will suffer for the crimes of all humanity. Yet what is her true nature? Why are the great mountains riven, and the oceans exposed to the dominion of Dragons? What is the enigma of the ancient Queen of Fire and Eternity? >>>Nothing is as it seems. Only a journey into the very soul of darkness will reveal all, and in the crucible of tragedy and fate, Zhialeiana’s love will be put to the ultimate test. >>>Thus the worlds of Islesong and Dragon joined together, and Water and Cloud became one. I have just read all three of these world-sea stories. Now I have to wait for the next installment. I really want to know what happens next. I loved the writing, the characters, the world, and the overall message of the books. Wonderful. Thanks for hours of pleasure. I had thought that this would be the concluding volume - third in a trilogy and all that, but no, Marc Secchia is taking us further than we had imagined, or even dreamed. I liked this better than the second volume, and perhaps even more than the first, although the latter is a close call. 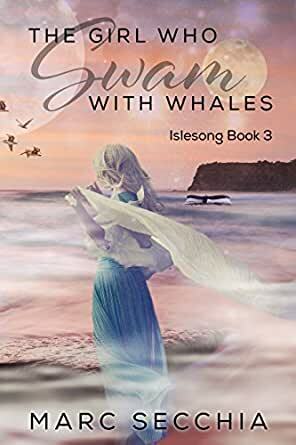 'Swam with whales' is a massively understated title, considering that Zhia sets out to cross the world-sea, and ends up discovering whole new concepts about her world, never mind continents or oceans. The author has a wonderful gift for engagingly descriptive writing which can immerse (go on, smile please!) the reader in his brilliantly imagined fantasy Islesong world. Zhia's voyage and the awesome encounters on it were for me one of the peaks of enjoyment of this book. Flights of fantasy abound, until towards the end we must dive into the murky depths of the history of the world to discover - no, I can't spoil that for you. But I will say that while Zhialeiana-Susurrus has watched one after another of her friends find love, she has been rather left behind, until now. Because there's one very special encounter in this part of the Islesong story. Read it for yourself! Great series, looking for the next one. 5.0 out of 5 stars10 Stars! 5 stars does not do this series justice. I love all of Marc Secchia's books. He has became one of my favorite authors. For anyone interested in starting this series, I would go to his website and look at the reading order so that you can fully appreciate how these books to in together. 4.0 out of 5 starsEpic storytelling! Like all the books of the World-sea and Island-world, this was beautifully crafted with vivid word imagery to delight the imagination and stir all the emotions known to Man. There is romance, danger, betrayal, triumph, magic and much more. This is book 3 with an obvious book 4 in the wings. I am impatiently waiting for the sequel. I give this 4 stars only because of occasional editing errors. Were those to be corrected this is a five star adventure. 5.0 out of 5 starsDon’t miss the his series!! This is a series that I’ve fallen in love with! Marc’s characters are so full of life, his stories so intricate and compelling that putting his books down is impossible. Lol This book is no different. I highly recommend reading all 3 of his whales books. You won’t be disappointed! I hate reading series because I hate waiting for the next adventure of the main characters. That being said, I love this strong female. The story line is different and keeps me wondering what is going to happen next. So.....I will anxiously wait for the next book.